March has many great fun themes that you can utilize to grab the attention of you patients or prospective patients. Many of our practices have used St. Patrick’s Day themes with great success in March. From “Lucky You”, to “Giving Away a 4 Leaf Clover to new patients,” even using “the leprechaun and the pot of gold” in to themes. In addition we have recently designed some new campaigns that demonstrate that many people rely on prescriptions or pain meds as the answer but that is really “fool’s gold.” In comparison, “Your Chance to Get Healthy and Pain Free…. 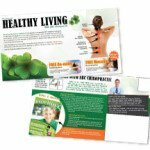 Naturally without drugs!” It grabs attention and lets people know that you are able to help not just get out of pain, but remove it and help them have optimal health! If you are interested in a March Postcard we have many great options for you! NOTE: Every design you see will be customize designed to your practice for FREE! That means we can change anything you want, from images, color, text, pictures, map…. ANYTHING! So think of the designs as a starting point that we will make uniquely yours! We make it easy but also effective. You better HURRY, March is here and if you want to get a campaign out you need to act fast! We have our March campaigns discounted so click on a design to go right to the Online Print Store where you can select the size and quantity you want to see the discounted price. After Check Out we will contact you and design the card to your specs. If you have any questions, would like a custom card or prefer to speak to someone, just give us a call at 360-326-8896 or use our Live Chat.